This is one of these dishes that I loved as a kid as much as I love it now. A true family favourite at many Greek homes around the world. Little Shoes (Papoutsakia) are a Sunday special, a holiday treat and a more indulgent version of the know Imam Bayildi. Below is a recipe that might convince you that Little Shoes are as easy to make as lasagne, or a pasta bake, if not easier. Little shoes can easily be transformed to a vegetarian version as suggested below. If you are vegan you can remove the béchamel and still have a very tasty special dish. If you use plain wheat free flour for the béchamel you can have a dish for your wheat intolerant friends. This dish can be easily adapted to your taste and needs. Sauté the onion in a little olive oil with a pinch of salt until nearly translucent. For the Quorn mince add a little more oil so that it does not stick to the pan. For the beef mince keep stirring so that the mince remains separated and evenly browned. Add the wine and stir for a couple of minutes. Add the chopped tomatoes, the garlic and the parsley, stir, cover and cook. The filling is ready when the mince has absorbed all the liquid but is not dry. This should take approximately half an hour for quorn and a bit longer for the meat version. 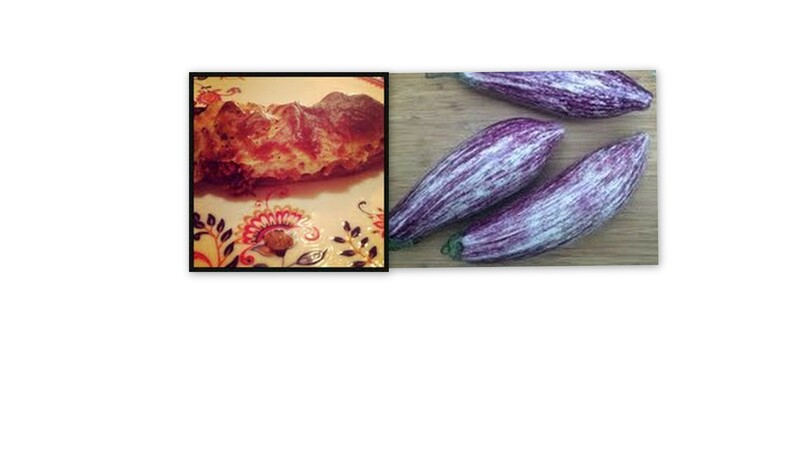 Wash the aubergines, cut the stalk end off and slice in half lengthwise. Bring a deep pot of water to the boil, add the aubergines and boil until they are slightly soft (5-10min). Pull open to create enough space for filling. Add the milk to the pan and stir in the flour making sure it is well mixed with no lumps . Place on medium heat and bring to the boil stirring more as the temperature rises. When the sauce starts simmering lower the heat, add the butter and stir continuously. Add nutmeg, salt and better and a whipped egg. Continue stirring on low heat until the sauce thickens. When removed from heat keep stirring, add the grated cheese and mix well. Add the filling to the aubergines evenly. Spread the béchamel on top of the filling. Bake in a preheated medium temperature oven until the béchamel is golden (about half an hour). Rest and cool down for 15 minutes before serving. 1kg of aubergines should be 5 medium pieces of the tsakoniki, flask variety. You can cook this disk with the normal aubergine but the tsakoniki variety is much nicer with this dish and cooks faster. 500grof quorn make more filling than 500gr of minced beef so you might be able to fill an extra pepper. You can add the Quorn mince frozen to the pan. This should take a few more minutes than when your mince is defrosted. Overall cooking with quorn should be faster than with meat at this but also the sauce cooking stages. I prefer a flexible wire whip when making béchamel and it helps avoid lumps. I used plain wheat free flour this time which was very easy to mix in the milk and made a very creamy sauce. This entry was posted in Greek cuisine, Recipes, Vegetarian and tagged aubergine, aubergine bake, bechs, Greek cuisine, Greek recipes, Παπουτσάκια, μελιτζάνες, little shoes, vegetarian. I have also cooked this using lentils instead of mince (quorn or meat) for a vegetarian option and it was delicious!! !